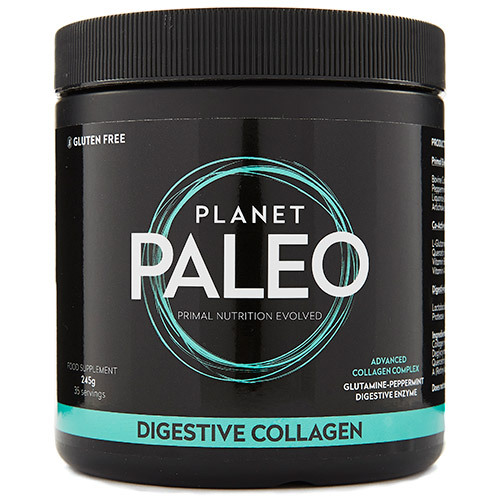 Planet Paleo`s Digestive Collagen contains pasture-raised beef collagen, L-glutamine and a carefully chosen synergistic herbal blend with co-active nutrients. Our primal ancestors would have consumed the whole animal when it was caught, cooking up the bones in order to release nutrients within such as collagen protein. Fermented foods rich in the bacteria Lactobacillus plantarum were a big part of the diets of traditional cultures and they would finish a good meal with herbs such as peppermint and liquorice which have a long history of use as an after meal tonic. Planet Paleo is a paleo diet inspired food and food supplement company specialising in pasture raised and grass fed bovine collagen products. Collagen Hydrolysate (Bovine), Peppermint leaf, L-Glutamine, Deglycyrrhizinated liquorice root, Lactobacillus Plantarum, Quercetin, Artichoke leaf, B6 (Pyridoxine hydrochloride), Vitamin A (Retinyl acetate), Protease. Take 1 level scoop once or twice a day between meals or as directed by your healthcare professional. Mix with at least 200ml of water or juice. Below are reviews of Planet Paleo Digestive Collagen - 245g by bodykind customers. If you have tried this product we'd love to hear what you think so please leave a review.